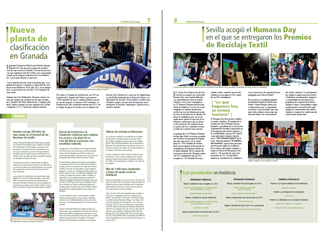 The Foundation presented last Saturday, under the basketball match between Club Basketball Cajasol Sevilla and Bilbao Basket, the first issue of "Humana News", a newsletter in which it realizes the activity that the organization carries out in Andalusia. The "Humana News" was created for being a means to interact and communicate news about the Foundation donors textile used as well as institutions and private entities that collaborate with the entity. 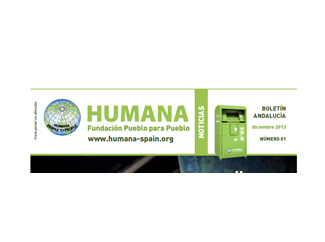 It wants to be also a tool to disseminate the initiatives and projects we do in Andalucia and to acknowledge the support and trust that citizens and employees in the work deposited Humana develops in the community. The newsletter includes news, experiences and testimonies about the main lines of work Humana: environmental protection, development cooperation, job creation, agriculture and social welfare activities. Published 25,000 copies will be distributed in the coming days in Seville and Granada as well as in other Andalusian cities and towns in which the Foundation operates. It can be found as well in the four Humana second hand shops in Andalusia (2 in Sevilla and 2 in Granada).